In 2004, Doom 3 was a disappointment. It neither captured the speed of the original game or the lofty cinematic ambitions it tried to chase after. Instead, it was a slow, methodical shooter that leaned on its horror elements far more than previous games in the series. The game was at its best when it left the tight corridors of the space station and took the player back to hell -- thankfully BFG Edition's exclusive Lost Mission expansion returns to this setting while offering a lot more. Whether out of curved expectations or improvements made to an eight-year-old game, I was surprised to find myself thoroughly enjoying Lost Mission. Though the game still lacks the open space, high enemy count, and ridiculous speed that defined Doom 1 & 2, this new environment brings Doom 3 a bit closer to its heritage. Instead of creeping down dark corridors with a flashlight in hand, I strafed past enemy projectiles while filing the screen with rockets. I didn’t play Doom 3 until 2008 but I was still impressed with its visuals on a PC with max settings. BFG makes the game look even better with a redesigned lighting system and impressive 3D capabilities (for those with the proper hardware to use it). The game looks better than many current releases, yet doesn’t seem all that different than I remember. That’s pretty much all you can ask of a HD re-release. As Jim Sterling said in his E3 preview, BFG Edition makes some minor changes to the combat. Most noticeably, the flashlight is now accessible while carrying a weapon. However, the flashlight has a battery that drains quickly. I personally was a fan of the flashlight in the original, since some memorable moments came from it. One moment had the player defending moving cargo on a track in a pitch black room. The tension between shooting enemies and seeing where the track extends to was unreal. I am worried how this new mechanic will affect that amazing scenario and others like it. Though changes were made, BFG Edition isn’t perfect. One thing that really irked me is the infuriatingly slow reload speed on the double-barreled shotgun. It rendered Doom 2’s defining weapon useless which is a real bummer as a series fan. There are a less lost souls, closet spawns, and other annoying features of the original Doom 3 but this is largely the same game. Well, except for Lost Mission. Lost Mission can be accessed at any time from the main menu. It takes place in Hell and is centered around killing hordes of enemies until the path forward unveils itself. It’s nothing groundbreaking but its the sort of cathartic, violent release that Doom 3 largely neglected to offer the player. It was a real shame too because the game has such amazing gun and enemy design that it begs for these big bombastic battles. Lost Mission gives the player a couple hours worth which may merit the return for some Doom fans. 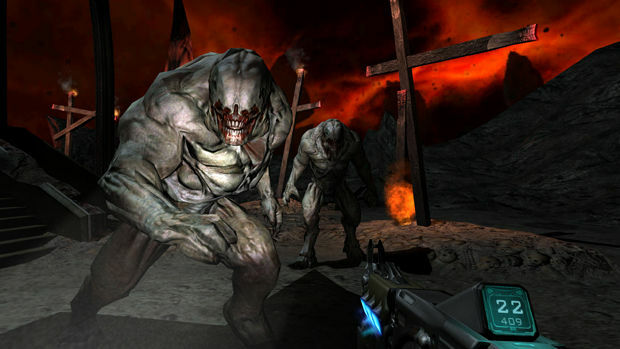 Though this expansion has no new weapons, it does contain modifications of established Doom 3 enemies, including a boss. 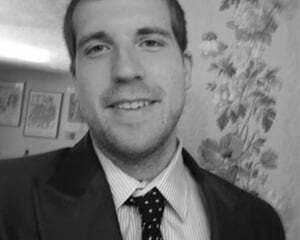 It's also quite difficult, designed for players who have already mastered the game and its previous expansion. 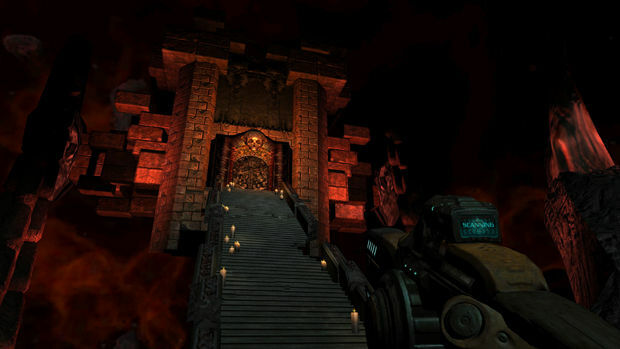 Doom 3 BFG Edition will come with the Xbox Live arcade ports of Doom 1 & 2, Resurrection of Evil expansion, and a revised, visually updated Doom 3. No word on whether the co-op mode exclusive to the Xbox port will be part of the package but one can hope. 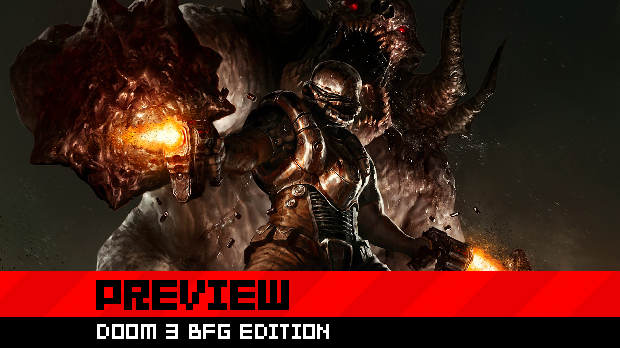 Though I don’t look forward to going through the slow start of Doom 3, there is still a lot to love about this re-imagining of a bold but flawed shooter. If nothing else, BFG stands as a definitive collection of the series highs and lows, all while trying to make its rough moments a bit more smooth.